Thyme tea is an aromatic herbal remedy that has a long history of medicinal use for its antiseptic action. This Mediterranean herb is particularly well known for its seasoning flavor and aroma. What makes this herbal tea so special? Cleansing and healing, it helps to clear the body of unwanted toxins and other elements that cause you to be sick. A great refreshing tea that has many other health benefits that you may reap. Come and find out more about this fragrant herb! Common thyme, in Latin thymus vulgaris, is a perennial shrub native to Southern Europe and Asia, about 15-20cm tall. Today it is planted around the world for decorative or culinary purposes. This aromatic shrub has woody stems and small, tiny fragrant green-grey leaves. When it blooms in the spring and summer months, the shrub becomes covered in many little thyme flowers in lovely white, pink, violet or lilac tones. There are other varieties of thyme, but common thyme is the most used and loved for cooking and medicinal uses. 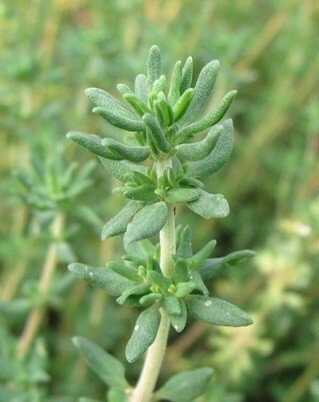 Leaves, flowers and stems are generally made into thyme tea. This herb has long been known for its many health benefits. Going back in history, you would find thyme being used by the Ancient Egyptians in embalming rituals. The Ancient Greeks also resorted to this herb to burn as incense in temples, linking thyme to the source of courage, high spirits and power. The Romans are believed to have helped spread the use of thyme in Europe, using it to purify rooms in the face of disease or melancholy and also to season and preserve foods. By the Middle Ages, Europeans would keep this herb under their pillows to induce sleep and prevent nightmares. 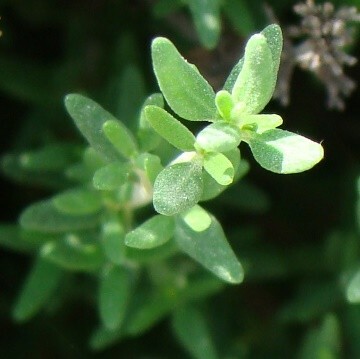 Thyme was still linked to courage and so it was common practice for ladies to offer a stem to knights. Thyme kept its presence in religious ceremonies, particularly in funerals as it was believed to help with the transition to an afterlife. In times of plague, large amounts of thyme would be burned to help clear the air and keep the disease beyond the doors of the town. This herb would also be found in use in traditional eastern medicine, particularly as a healing tonic and relaxant. Today thyme is still used to make a medicinal tea, but it is also much enjoyed around the world as a seasoning herb, adding flavor and aroma to sauces, soups, stews, meats and poultry. Some people will even go as far as use it as a food preservative. Its antimicrobial properties that make thyme herbal tea such a healing beverage as well as helpful herb that allows food to last longer. Thyme has also found its way to the cosmetic industry in the shape of soaps, toothpastes, perfumes, scented healing ointments. This very common herb is incredibly rich in elements that are beneficial for your health, resulting in a very nutritious cup of tea. 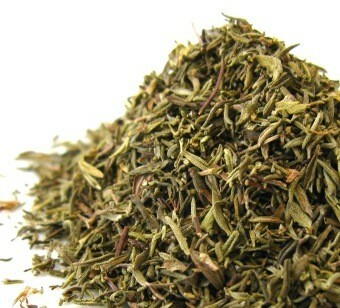 A cup of thyme tea contains calcium, chromium, iron, magnesium, manganese, potassium, and selenium. It also contains flavonoids, vitamins B-complex, C and D, tannins and carotene among other components. If you are showing symptoms for the common cold or flu then consider drinking a cup of hot thyme herbal tea sweetened with nice golden honey. This popular herbal remedy may help strengthen your respiratory system and combat your head cold. Thyme tea is particularly good as an expectorant, helping to clear mucous from lungs and congested passageways, relieving nasty coughs. It may prove useful in cases of bronchitis, laryngitis and whooping coughs. Tip: Try gargling with cooled thyme tea to help treat and soothe throat inflammation. In case of fever, this herbal tea may help promote sweating, helping your body to cool down as it fights the infection causing the high temperatures. Breathing in the steam of a thyme infusion may be quite helpful to clear the nasal passages in the occurrence of infections or simple allergies. At the same time, this steam may also help clean the air of a sickroom with its antiseptic and anti-bacterial action. This tea may treat other respiratory problems such as allergies, sinusitis and hay fever. Its antispasmodic action may help soothe and relaxes respiratory muscles and reduce the severity of asthma attacks. Are you prone to suffering from digestive problems from a simple stomachache to more serious irritable bowel syndrome? You may then wish to try drinking a cup of thyme herbal tea. This herbal tea may help to help soothe stomach muscles and calm intestinal spasms that cause painful cramping and flatulence. It may help soothe cases of colic, spastic colon and irritable bowel syndrome. Thyme tea may prove great for those who have a weak stomach. A cup of this tea may help ease feelings of nausea, particularly when you blend it with ginger, helping you to recover your appetite. This tea is often used by those wishing to get rid of parasites and worms in the digestive tract, at the same time it removes excessive mucous and toxins from the intestines. It may even treat and prevent diarrhea. Thyme tea is great to give you an energetic boost as it is considered a stimulant said to promote longevity, clear thinking and general feelings of well-being. This tonic tea may help if you are suffering from a nervous condition such as depressive states and mood swings, bouts of insomnia or exhaustion, and feelings of melancholy. 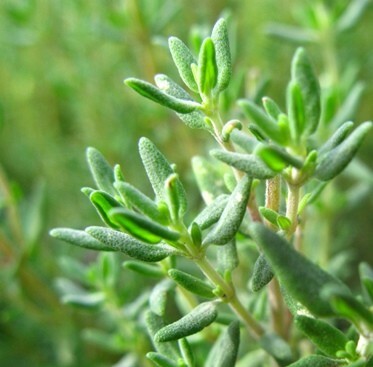 Thyme makes a healing infusion that may be used when you have a headache or a migraine. You should actually try to take this tea as soon as possible, not allowing the headache to settle in. 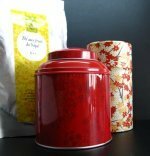 This herbal tea may be used as an analgesic to relieve muscle pain. You may drink the tea or use it to infuse your bath water with the healing properties of thyme. 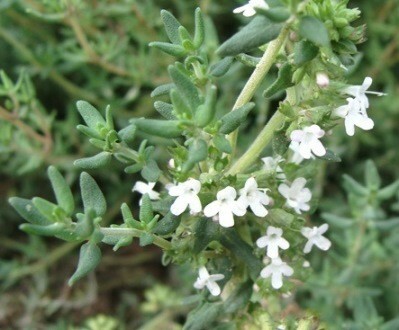 Women may find thyme tea useful to ease menstrual cramps and PMS. Taking thyme 2 to 3 a day may help if you suffer from menstrual spasms and colic. It also helps to regulate the menstrual cycle by stimulating blood flow to the uterus. Thyme herbal tea brings balance to your hormone production by improving the liver function, decontaminating it of toxins. A well-functioning liver may also help you deal better with hangovers. A cup of thyme tea a day may help protect your heart and brain as it is rich in omega-3 fatty acids, essential to help lower cholesterol levels and deliver healthy nutrients to the brain cells. Thyme tea may also help lower blood pressure by improving blood circulation increasing the amount of iron in the blood, thus aiding in cases of anemia. You heart and brain may be helped by the strong presence of antioxidants in this infusion. Antioxidants such as those present in thyme may also help to prevent and remove tumor growths. A daily cup of thyme herbal tea may be a great aid for your immune system, boosting your bodily defenses against infection caused by microbes, viruses, bacteria or fungi. Its action may be both in the way of speeding up recovery from illness, but also in terms of protecting against future ailments, both internally and externally. This herbal tea may help to treat urinary and kidney infections, alleviating symptoms of water retention and incontinence. You may use this tea as an antiseptic gargle to treat mouth and throat infections, and even get rid of bad breath. You may use it as a disinfectant to help clear away harmful elements that could cause inflammation and pain. The antiseptic action of thyme tea makes it great to use as a skin wash. It may be used to clean wounds before dressing them, soothe itchy feelings and irritation brought on by insect bites. Helping the skin to heal more quickly, it may be used on cuts and bruises. Use thyme tea to kill nasty fungus that cause toenail infections or athlete's foot, skin parasites as well as lice. This herbal tea may help alleviate the inflammation in joints and relieve pain caused by arthritis and rheumatism. Make a nice compress and apply to the area in pain and it may even help relieve sciatica, and muscle cramps and spasms. Apply a cooled thyme infusion to infected eyes to treat pink eye and conjunctivitis. Use a clean cotton ball and carefully clean your eyes. 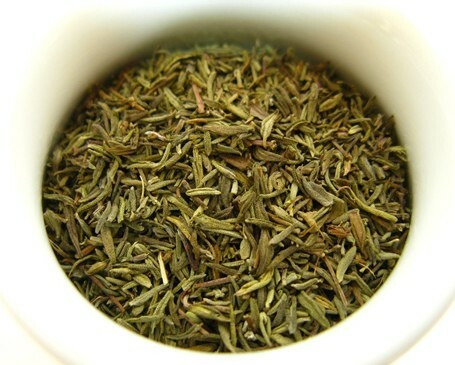 Thyme herbal tea may be used to clean oily skin, giving you a fresher look. Its antiseptic action may even reduce the occurrence of acne, blemishes and dermatitis. Some even say that by dabbing the skin with this herbal tea, it may reduce wrinkles. Take a sip of Thyme! Although this is a very healthy herb with practically no side effects, that are still some aspects that you should take into consideration. Too much of a good thing may also be harmful as it may cause an allergic reaction forcing you to stop taking thyme infusions altogether. While a regular dose of thyme tea may help the digestive tract, too much could cause heartburn, nausea, vomiting and diarrhea. A high dose of this herbal tea may also cause headaches and dizziness. If you are allergic to mint plants, then you should avoid thyme tea as it belongs to the same family. An allergic reaction could result in itching, skin rashes, and tightness of the throat and shortness of breath. Important: If an allergic reaction occurs, stop using this tea at once and see a doctor if symptoms persist. Do not drink this infusion medicinally if you are pregnant or breastfeeding. This herbal tea may stimulate the uterus and bring about a miscarriage. If you have suffered from heart problems in the past, or have experienced peptic ulcers then you should be careful when drinking thyme herbal tea as it may irritate your ulcer. Be careful if you are taking any medication, as a medicinal dosage of thyme tea may enhance or alter the effects of your prescription medication. Talk to your doctor about drinking this tea, as it may just be a case of adjusting the amount of your current therapy. To make the most of all the health benefits above, go ahead and learn how to make thyme tea. This herbal tea may be made using mainly fresh or dried thyme leaves, but also stems and even flowers. So let’s put the kettle on make a cup of healing tea. Begin by boiling water, making sure to use good quality water in order to get the best flavor and most benefits out of your herbal tea. Place 2 teaspoons of dried thyme per cup of water (250ml) in your teapot. If you prefer to use fresh thyme leaves, then place about 3 to 4 teaspoons of fresh leaves per cup of water in the teapot. Pour the boiling water into your teapot and let the thyme steep for about 10-15 minutes. Drink about 2 to 4 cups throughout the day of this infusion. At first you may wish to start with a smaller dosage in order to let your body get used to the medicinal treatment and test for allergic reactions before increasing to the regular daily dosage. Add honey to sweeten your tea while at the same time making your thyme infusion even more effective as a treatment for colds and coughs. 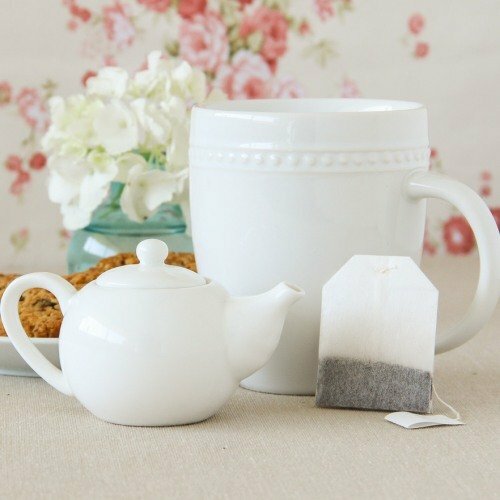 Once your tea is ready to drink, take a sip and feel the strong aroma and warm, pleasant and tangy flavor of the brew. However flavorful you may consider this herbal tea to be, you will find that it is not overpowering. 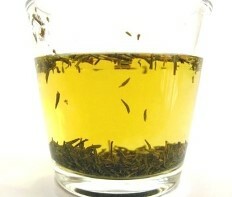 You may blend thyme with other herbs to enhance both flavor and benefits of the resulting infusion. A good herb to blend with thyme is rosemary, as it promotes pretty much the same beneficial properties. Buy Your Thyme Tea Today! 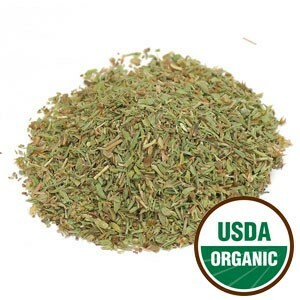 Click on the image or on the link below to purchase from Starwest Botanicals your Organic Thyme. 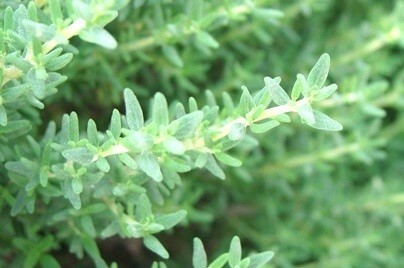 Great for making a healing tea or just seasoning a fine dish, organic thyme has a place in every kitchen. Brew a cup of tea with this fresh and aromatic herb. Buy your Thyme tea now! Easy to find and quite affordable, this is a great herb to have at hand for an emergency around the home. You don't have to keep suffering when there is thyme tea to be enjoyed. 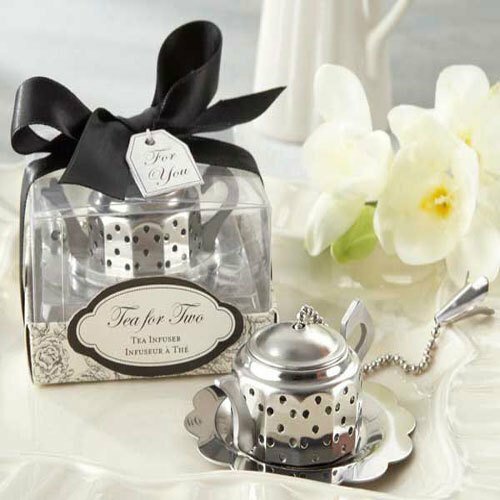 So let the aromas of thyme tea fill the room!